Blind Emboss - Blind embossing does not include the use of ink or foil to highlight the embossed area. The change in the dimensional appearance of the material is the only noticeable difference resulting from the embossing. The blind embossing process provides a clean and distinctive or subtle image on paper stock. It is best used to create a subtle impression or low level of attention to the piece, yet provide some slight form of differentiation for the finished work. A sample of a blind emboss using a single level die, is shown below. Note: If a multi-level or sculptured die is used, there will be varying depths to the embossing, giving the image a distinctive 3-D effect. Registered Emboss - Registered embossing is a process that places the embossed image in alignment with another element created with ink, foil, punching, or with a second embossed image. In the illustration below, the blind emboss is aligned within the larger printed circle to produce a registered emboss. Combination Emboss - Combination embossing is the process of embossing and foil stamping the same image. It involves imprinting and aligning foil over an embossed image to create a foil emboss. A sculptured die, generally made of brass is used for this procedure. The process requires close registration that must be controlled to keep the image and foil matched precisely. A combination die is used to foil stamp and emboss in one operation. The combination die has a cutting edge around the outside of the die to cleanly break the excess foil away from the embossed area. Pastelling - Pastelling is also referred to as tint leaf embossing. It involves the process of using a combination die to provide a subtle antique appearance to a substrate that is foil stamped and embossed. Pearl finishes, clear gloss, or similar pastel foil finishes can be selected giving a soft two-color antique look (without scorching) to the embossed image. Lighter colored stocks work best to provide this soft contrasting effect. Glazing - Glazing refers to a finished embossed area that has a shiny or polished appearance. Most often this process involves heat that is applied with pressure in order to create a shined and burned impression into the stock. Generally, darker colored heavier weight stocks work best to create this polished effect and to eliminate or soften any burned appearance that may result from the heat. When used with foil, the process creates a slightly brighter appearance to the foil. Scorching - Scorching is similar to glazing except that it is not used to polish the stock. Instead, scorching does what it implies: as the temperature of the die heating plate is increased beyond the normal temperature range, a scorched effect is created in the embossed image resulting in an antique or shaded appearance to the stock. A lighter colored stock is best for this procedure to provide a unique two-toned appearance. Caution should be used in requesting this effect, since it is easy to burn the stock if too much heat is used. If scorching occurs too close to the printed copy, it can interfere with the clarity of the printed copy, unless the objective is to accomplish that effect. Embossing is basically used to create an effect. The greatest concern and emphasis on the client's behalf should be placed on the outcome of the embossed effect. In order to achieve the most distinctive effect, it's important to understand the embossing process and the types of dies that are used for embossing. Pressure - The intensity of the impact on the weight of the stock being embossed. Heat - The ability to keep the heat consistent and at a proper level for the best impression. Die Depth - The client's artwork or the engraver's efforts will initially determine this, however, if by looking at the artwork it appears necessary, the die may need to be tooled to gain greater depth. The illustrations show the side views of the embossing dies. The die is straight and level with only one depth. It is generally used for lines, borders, and single-dimension images or line art. It provides a well-defined edge for the image. It is also referred to as a dimensional die. Several distinct levels of depth are used to add a variance in dimension to the image. It is often used with images having unique detail such as landscapes or feathers. A round edge die provides a soft edge effect rather than a hard ruled edge. It is often used to provide the sense of a round object coming outward from the paper and continuing out beyond the stock. An alternative that provides the appearance of combining the softness of a round edge with the well defined lines of a distinct edge. It is very effective when used in heavier gauge stocks that may tear easily upon impact. A hand-tooled brass die that has a variety of depths. Varying levels of the sculptured die create a dimensional depth and appearance for the embossed image. It is very effective for blind embossing and scorching. Each die can have a different beveled edge that will affect the appearance of the embossing. The beveled edge of the die is generally sloped at 30, 45, 50, or 60 degrees. A 30-degree slope will provide only a slight shadow to the embossed edge while a 60-degree slope may provide a very rounded and heavy appearing embossed edge around the image that is embossed. The depth of the die can also be important in creating the desired effect. The deeper the die, the more pronounced the embossed image. Combining a deeper die with a higher degree of slope will result in an embossed appearance that becomes fuzzy and enlarged on heavier grade stock. It is important to recognize what will work best for the stock and the die that will be used for a project. As an example, a heavier material, such as cover stock, works well with a beveled die since the thickness of the stock can withstand the impression of the angled edges. However, lighter weight stocks will not provide enough thickness to show a noticeable difference when using dies that are angled. Dies with a sharply angled edge can have a tendency to tear the stock when it is embossed. Generally, a combination of 30 or 45 degrees of slope with a depth of .010 to .015 results in the best impression for a sharp and clean embossed image. It is a good idea to consult with the company doing the embossing if a desired effect is required. The guide at the right illustrates the results of embossing with four different degrees of bevels and four different die depths. The effects shown have attempted to represent embossing on a 65# cover stock. It is intended to depict that a die having a depth of .025 with a 60-degree bevel will distort the image the most, providing an enlarged and rounded or filled-in embossed image. In comparison, the die having a .010 depth and a 30-degree bevel will have a fine-lined effect around the outside edge of the embossed image, rather than a heavier, bolder outline as illustrated with the 60-degree bevel. Factors to consider in stock selection include surface characteristics, grain, gauge, weight, material density, printing inks or coatings to be applied, and finishing processes to be used. Generally, the stocks most receptive to embossing dies are stocks that are uncoated, heavier in weight, and have a felt finish. Embossing on heavier stocks will most often provide greater dimensional depth and detail. If some of the stock being embossed or hot stamped is thicker in gauge, advise the engraver to "tool" increased depth into the die to give more definition when it is embossed. The greater depth will compensate for thickness, memory, and stock resistance. It is desirable to have the die "bottom out" or strike the paper at the point where the stretch of the material comes close to reaching it's maximum limit without cracking or tearing. Coated, varnished, or lightweight stocks have a tendency to crack when embossed. Paper and ink have limitations in the degree that they can be stretched before cracking. Coatings cannot be stretched, so care should be taken with any type of embossing on coated or varnished stock. Embossing with foil instead of ink can assist to eliminate cracking on coated stocks. If heat is applied to the embossed die, such as in foil stamping or glazing, it will increase the chances of the coated and lightweight stock becoming brittle, which may cause the embossing process to crack the stock after the die strikes the material. Textured stocks may compete with the embossed image if the texture is too deep. However, for a blind emboss, a slightly textured stock provides the best results. 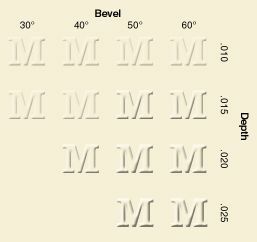 Consider the direction of the paper grain when embossing or scoring. Emboss and score in the direction of the grain since going against the grain can cause cracking problems. Occasionally, such as with borders, it is necessary to go against the grain to achieve the desired effect. Recycled paper may cause the embossing to be inconsistent in appearance from sheet to sheet, since the higher the content of recycled fibers, the weaker the stock when exposed to heat and pressure. Use paper with 30% post-consumer fiber or less. Long-fiber sheets are the best for embossing, since they are capable of handling a wider variety of embossing dies, particularly the deeper dies. Sulfate and foils are the best board stocks to be used when embossing packaging materials. Set copy or create images with fonts above 12 point and lines thicker than 2 point. Use images that are more open and have fewer thin lines. Embossing will have a tendency to fill in small, enclosed areas, thin lines, or closely kerned text. Thin serifs do not emboss well unless they are large and well defined. For greater depth, provide more letter space in the artwork. Copy or images with very close registration may involve extra work and greater cost. Be careful not to use trapping techniques on any artwork appearing adjacent to embossing and foil stamping. Screened copy and images with changes in tones do not reproduce effectively into dies for embossing, so line art should be created as if it were a solid image or solid color. If a beveled die is to be used, the artwork and copy for the image may need to be slightly enlarged to compensate for the image and copy reduction that occurs due to the beveled edges. Keep images at least 1/2" away from the edge of the stock being embossed in order to eliminate wrinkles that will occur if the embossed image is too close to the edge of the stock. If the image has no appearance that easily indicates the direction of the image, mark the film "read right" to show which side prints up. Identify the top or bottom of the image so the engraver will understand how the die must be prepared for proper embossing placement. Color key proofs, used for viewing the proper image direction, are of much assistance to the engraver when creating dies. If the embossed image is to register with a printed image, make sure the engraver has one of the primary negatives for guidance. Make sure the film image is not distorted or altered in size from the original copy. For multi-level dies (also referred to as sculptured or dimensional dies), an engraver must be provided with a color coded, solid, opaque film for each layer to be embossed. The opaque film identifies the silhouette area of each layer. The engraver must also receive film of the line art that will contain the images to be embossed. Include a set of color keys that will be in register with the film and visually show the intended image. As a general practice, make sure the engraver has a color key, a mock-up of the design, and any other samples illustrating and defining the edges, shapes, and levels of the embossed image in order to assist with identifying exactly how the image is to appear when embossed. Refrain from using bevel edge dies when embossing and foil stamping as a combination emboss. The foil will not adhere to the beveled edge. Beveled dies are generally made of brass with the edge of the image being sloped 30 to 50 degrees. Do not use magnesium for beveled dies. Multi-level sculptured dies work best for scorching and blind embossing. Request a proof of the embossing or foil stamping, if possible, to eliminate surprises from possible misconceptions of the appearance of the finished product. Consult a die maker or print supplier before making a final image selection for the die. The engraver will know that the clarity and sharpness of the details is one of the most important elements of the foil stamping or embossing. Make sure the die maker knows the type of stock on which the die will be used. Finer detailed images will be best embossed with a shallow depth. Bold images are best for deeper embossing. The type of stock and the image will determine the depth of the embossing die. Logos or accents surrounding logos. Borders or highlights surrounding images or information used to attract attention. Elegant accents for distinctive symbols, images, graphics, or lines. Occasionally used for security in the form of seals or symbols of authenticity on certification for government documents, corporate papers, and official materials. It is considered an older form of security as more alternatives in print and technology have been developed. Note: Before creating an embossed die for use in a project, consult with the organization doing the embossing to insure that the stock and the image desired are compatible.